Play with your preschoolers with a higher purpose! Giggle and wiggle. Run and sing. This is the wonderful world of preschoolers. So how do we teach energetic little ones about Jesus? We let them play while they learn! Kids will delight in the games, drama, art, music, storytelling, and puppets as they learn about God’s Word and how to apply it to their daily lives. It’s as simple as Play. Listen. Talk. Delight kids with games, nature activities, art, music, stickers, storytelling and cool puppets as they learn about God’s Word. Introduce kids to Jesus through creative play. Spend less time preparing supplies so you can focus on investing in the lives of each child and family every week. Connect the church and home through weekly take-home papers and the God’s Story for Me Bible. 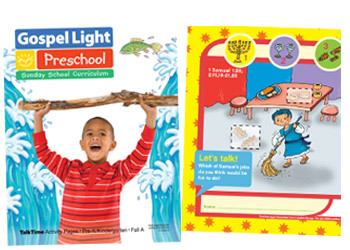 What resources are available for Pre-K / Kindergarten Sunday School Curriculum? If you can play, listen and talk, you can TEACH 2- and 3-year-olds Bible truth! Fresh design and simplified lessons make every lesson easy to prepare and fun to teach! Works best with TalkTime Activity Pages for each child, Preschool Music CD and Visual Resource (storytelling figures and posters)—the easy answer is to buy the classroom kit! With the Preschool TalkTime Activity Pages, kids will experience an interactive, colorful way to discover how God’s Word connects to their daily lives. Each activity is a 2-page spread, and sticker pages are easy-to-use, which saves preparation time! A fun sticker to wear home every week! 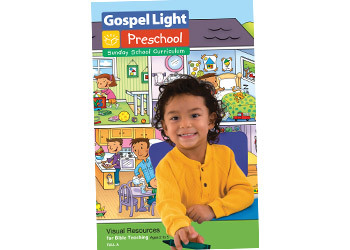 The Preschool Visual Resources contains all the posters and storytelling figures you need to enhance Bible storytelling and show preschoolers scenes from everyday life. The storytelling figures involve kids in the Bible story and can be used in many additional ways. Colorful, fun posters depict preschoolers in everyday situations of sharing, being kind and helping others. 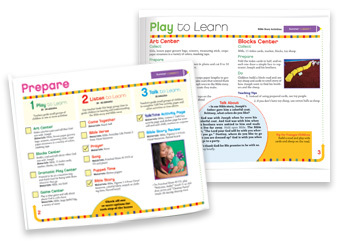 Game and activity posters are an easy way to call the group together for a quick game that introduces the next activity. Colorful activity posters that can be used in dozens of ways! 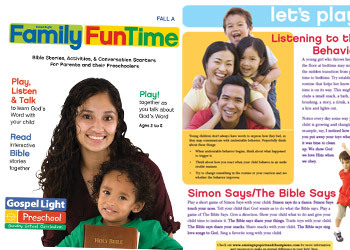 Send Family FunTime pages home with every preschooler and kindergartener, every week! This is a fun and interactive way for parents to retell the Bible story and help children remember Bible verses. Family FunTime gives parents ideas for asking good questions, having fun together, and helping their kids grow in faith. Nothing helps kids learn God’s Word faster than music! 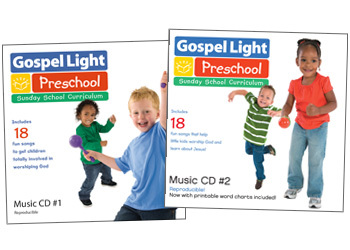 This 18-song CD is reproducible, so every child can have a copy. Songs include Bible verse songs, life application songs, welcome and goodbye songs and more. Also includes printable song sheets! Kids LOVE puppets! 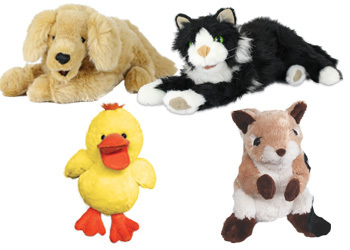 Our soft and lovable friends will work their way into the hearts and imagination any child. Every preschool lesson has a puppet script and these puppets are a must-have for your program. The following chart shows the recommended quarterly rotation for Gospel Light curriculum. 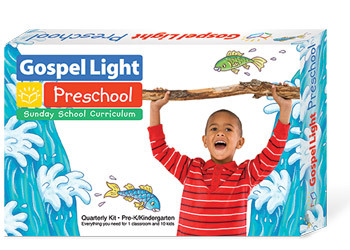 All Gospel Light curriculum is identified by the year (A, B, C, D) and quarter (Fall, Winter, Spring, Summer). Please be aware that for best results, every church should stay on-track with this recommended cycle. If your church decides to teach Gospel Light curriculum outside of the recommended cycle, sufficient quantities cannot be guaranteed in our warehouse or at one of our trusted reseller partners. 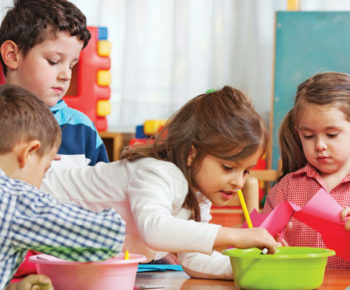 Using our unique Play, Listen, Talk teaching method, you can teach young children Bible truth! With fresh designs and a simplified format, lessons are easy to prepare and fun to teach! 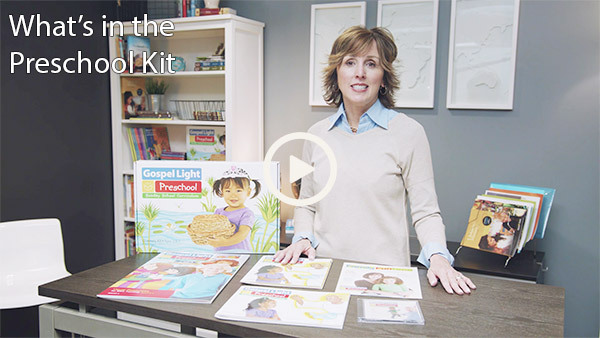 With the classroom kit, you have all the materials you need to for 1 teacher and 10 preschoolers—including a great resource to send home to their families! Additional kit items may be ordered separately. We’re here for you! Talk to your own personal consultant who will be happy to guide you through the program options that best fit your ministry. Find your consultant now. Before Gospel Light Preschool we never knew what to do with the boundless energy of our preschoolers. Now, with all of the great lessons and activities we are able to play our way to giving kids a first impression of our loving Savior, Jesus Christ.